Please select a pin to view properties in the urbanization. Albatross Hill is a development of 72 apartments and penthouses set in the heart of the Golf Valley. Each home is built to the very high standards and offers excellent views to the mountains and the coast. The development offers pools, gardens and tennis court. Golf courses and Puerto Banús are within easy reach. Aldea Blanca is a well maintained development consisting of apartments in a rustic andalucian style, the urbanisation offers 4 pools and mature gardens. This complex reminds you a little of the white villages in the mountains with its white buildings and wooden terrace pillars. Being only approximately 1Km from Puerto Banus, you are within walking distance to all amenities, the harbor, the beach and all shops, which makes it idea for families. Aldea Dorada This residential complex is set up of 25 luxury villas in the middle of Nueva Andalucía and yet only 5 minutes drive to the famous harbour Puerto Banús. The community is gated and has beautiful garden areas, a large swimming pool and an underground parking. Aloha Sur 32 This is a townhouse complex with 32 units set next to Aloha Sur 21 in the Golf Valley in Nueva Andalucía. The urbanization has one community pool and set within 5 minutes drive to Puerto Banús. Aloha Gardens is an urbanization built on a number of levels in an Andalucian styled village, the 2 or 3 storeys buildings of Aloha Gardens are set in superb gardens and most have spectacular views of golf and mountains. The complex has 3 swemming pools (one heated) all set in different parts of the garden. Restaurants, supermarkets, bank, bars, etc with walking distance. Aloha Lake Village consists of 55 two and three bedroom townhouses. The townhouses are sourounded by sub-tropical gardens, patios, fountains and three large swimming pools. This Mediterranean style complex is located in a quiet location in the heart of Nueva Andalucia yet only a short distance to Marbella and Puerto Banus. Aloha Park is set just above the valley of Aloha, surrounded by breathtaking natural landscape and with fantastic open views. Aloha Park offers the highest standard of features and installation. Mediterranean landscaped gardens with waterfalls and bridges, communal swimming pools (one indoor) and 24h security service. Aloha Pueblo, a cosy, typical Pueblo style urbanisation has brightly painted houses and beautiful landscaped grounds. Aloha Pueblo is located right in the middle of Golf Valley and with amenities nearby. Aloha Sur This small complex of 10 townhouses and 11 apartments is built during mid-80´s and is located in the heart of Nueva Andalucía. The commuity has one community pool. Altos de Aloha Small community set up of only townhouses in the area of Aloha Golf Course and built during the mid-80´s. The urbanization offers one heated swimming pool, tennis and paddle courts. The famous international bilingual school Aloha College is located nearby and the beaches and Puerto Banús within 10 km. Andalucia Alta is an attractive and well maintained complex. Close to all amenities and only 15 minutes walk to the beach and Puerto Banus. A small gated community with great gardens and with a fabulous pool area, one for children. Andalucia Garden Club is located just 2 minutes walk from the shopping centre Centro Plaza, Saturday market and bull-ring and 10 minutes walk from the famous port Puerto Banus and its beaches. The urbanization offers a large swimming pool with separate children's pool and tennis court. Azahara is one of the oldest front line golf development in Nueva Andalucía, built during the mid-80´s. Set next to Aloha Golf and with large community gardens & one swimming pool. The urbanization is uilt in two phases and has in total 146 apartments. Brisas del Sur is a gated complex of colourful townhouses set just in the heart of famous Golf Valley, Nueva Andalucia. All properties are built at different levels so that each enjoys views to the mountains and Los Naranjos Golf. The complex has a great large swimming pool and a practice golf course with trial garden. Cumbres del Rodeo is a beautiful gated residential urbanisation with 115 apartments penthouse/duplexes of 2, 3 and 4 bedrooms. This luxury development has fantastic views towards the Mediterranean Sea and mountains. Its south-west facing direction ensures all day sunshine. Dama de Noche is built in a typical Andalusian architecture with apartments of 2, 3 and 4 bedrooms. Set next to Dama de Noche Golf Course and within walking distance to the beach and Puerto Banus with all its amenities. The urbanisation offers a great tropical community garden, two big swimming pools, 6 paddle-tennis courts and 24h security. El Naranjal is an attractive white washed urbanization of 77 towhouses all built with a typical "Spanish pueblo" feel. This community is full of orange & palm trees and blooming bouganvilla. There is a huge swimming pool and a wading pool for children. El Palmeral is a townhouse complex with stunning gardens, fountains, 3 swimming pools, sauna, gymnasium and jacuzzi. Perfectly located for Golf enthusiasts. Set only 5 minutes drive away from Puerto Banus. Close to all amenities. Fuente Aloha, a luxurious complex with 76 exclusive apartments located in the golf valley of Nueva Andalucia, offering exotic gardens with a large pool area and a club house with heated indoor pool, sauna, Turkish bath and gym. Underground parking and 24 hour security in another important feature. All amenities within walking distance including various well know restaurants and cafés just next door. Puerto Banus and the beach is a 5 minute drive down the road where the sandy beaches are waiting. Hotel del Golf Las Brisas is an exclusive community with 150 private apartments set in the heart of the Golf Valley. Each property owner enjoys the facilities of Ls Brisas Golf Club House which they can access directly from the building. Community offers well maintained gardens with swimming pool and 24h security. La Corniche consists of 113 luxuriously 2, 3 and 4 bedroom apartments and penthouses. An exclusive residential development situated within the famous Golf Valley of Nueva Andalucia. Designed in a contemporary style. This gated complex with 24h security offers landscaped gardens with 2 large swimming pools, one heated, sunbeds and paddle tennis court. La Retranca This small development with only townhouses set next to Aloha Golf Course. Built during the mid-80´s and the community has one swimming pool. Puerto Banús and the beaches within 8 minutes drive. La Trinidad is located on the Golden Mile and is a community of 116 luxuriously apartments and penthouses. It comprises eight buildings, arranged in a horse shoe around 7.2 hectares of manicured gardens with ponds, fountains and a wooden area. The urbanisation offers 24h security and CCTV, 2 very large swimming pools with extensive sun bathing area and a café open during the summer months. Furthermore, a health complex including indoor heated pool, paddling pool, saunas, fully equipped gym, kids play area, table tennis and a social library area. The beach is within easy walking distance and Puerto Banus is a 25 minute walk along the spectacular new sea front walk as well as Marbella in the opposite direction. La Rinconada is set up of apartments and townhouses, located near Las Brisas and Aloha Golf in the Golf Valley. Built during the end of 80´s and offers large community garden and one pool. Walking distance to bank, restaurants and cafes and within 5 minutes drive to the beach. Las Alamandas is a luxury development and lies between the golf courses Las Brisas and Los Naranjos. Each building has four apartments and two penthouses. A central lift services each floor from the private underground parking area. Beautiful gardens with three sweimming pools, all very different in desighn and landscaping, one is heated all year round. Gated community with 24h security guard. Las Brisas Country Club is a small community of only 18 apartments, located first line golf Las Brisas. This gated urbanisation has great tropical gardens, 2 swimming pools (one indoor) and 24h security. Las Tortugas is a secure gated community built in modern Mediterranean style with 60 apartments set in the back of Nueva Andalucia and the well know golf valley. With breath taking views to the coast and the valley this peaceful complex offers sub-tropical gardens with great pool area. Ideal for golfers that want to be near either Las Brisas Golf, Los Naranjos Golf or Aloha Golf. Only a short drive to Puerto Banus, beaches and all amenities. Last Green is a townhouse complex and sitting over the 11th hole of the prestigious Aloha Golf Course, just of the heart of Nueva Andalucia. The urbanisation offers larga gardens, 2 swimming pools and tennis court. Gated complex. Le Village is a gated urbanization with only apartments, set in the middle of the Golf Valley. The community offers communal gardens, two swimming pools (one indoor heated), paddle court, clubhouse and gym. Les Belvederes is a development with only 32 apartments situated on the hills of the Golf Valley. This gated community has a 24 hours security guard, large community pool area, underground parking, 2 tennis courts and a gym. Lorcrigolf is a small community with 24 apartments and a few commercial premisses. 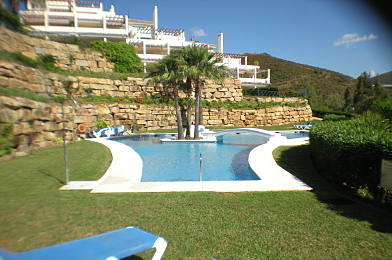 Situated next to Los Naranjos Golf, opposite the Club House. The two blocks offer underground garage, lifts and saunas. Garden area with swimming pool. Locrimar is just a short stroll away from Puerto Banus and the beach. This development consists of five phases. Communal illuminated landscaped gardens and swimming pools. Phase two has 3 paddle tennis courts and lies next to the International Tennis Club. Local restaurants, bars and the casino are all in a walking distance. Los Arrayanes is a great development of 39 apartments and penthouses, situated on the hills of Nueva Andalucia. Los Arrayanes offers splendid views over The Mediterranean Sea and the golf courses. The complex has two pools on different levels. Garden areas with ponds, fountains and cascades. Los Dragos is one of the oldest developments, next to Aloha Golf, in Nueva Andalucia. Due to this location, Los Dragos is still very popular and it offers large mature gardens with swimming pool and tennis courts. The beaches and the glamorous Puerto Banus are just a short drive away. Close to all amenities. Los Granados Golf is arranged in an arc and is set up of 55, 2 and 3 bedroom apartments and 4 bedroom duplex penthouses. All penthouses has their own private heated swimming pool. The development is set front line golf Las Brisas and features, large swimming pool, social club with open air heated pool, gym, jacuzzi, Turkish bath and saunas. Los Jarales is a closed urbanisation set next to Aloha Golf Course, which offers well maintened gardens. All houses have great views over the golf course. Los Naranjos Country Club is located in the heart of the Golf Valley in Nueva Andalucia and surounded by 5 famous golf courses. This pueblo is a typical Andalucian village with orange trees on all the streets, mature garden, 3 swimming pools, one hated, squash and tennis court. Magna Marbella is a development with apartments and penthouses 2-4 bedrooms, large covered and uncovered terraces with exceptional views. All penthouses have private swimming pool on the large roof terrace with 360 degrees beautiful wide views. Communal areas include exterior and interior gardens and swimming pools. Gated complex with 24h security guard. Malambo is located only steps away from the bull-ring of Puerto Banus and Centro Plaza where you can find shops, restaurants, bank and supermarket. Only five minutes walk to Puerto Banus and the beach. Great communal area with swimming pool. Palacetes de Belvederes is a residential complex set in the Golf Valley of Nueva Andalucia and nearby various golf courses. The apartments and penthouses within the gated community are very spacious. 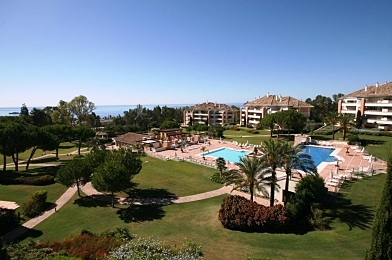 The complex offers wonderful views across the Golf Valley and the Mediterranean Sea.